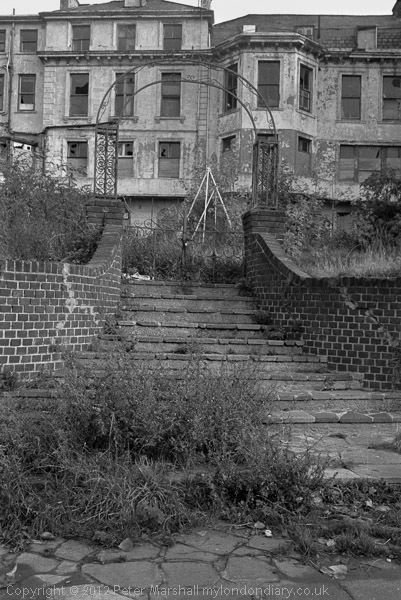 Sorting out the hundreds of my images from the 1970s that I’ve thought worth scanning I came across this one, not a great picture – which is perhaps why I couldn’t remember where I had taken it. I looked out the contact sheet to find little help. There were a series of half a dozen frames of this and adjoining scenes, but nothing obviously to indicate where I had been when I took them. The frames to one side were recognisably from the Shell Centre at Waterloo, and those after this were from close to my home, but there were no clues as to this location. The pictures seemed fairly carelessly framed (this may have been deliberate) and the only information I’d written on the contract was that they had been made with one of the several little Minox 35mm cameras I used to carry in a pocket all the time (I punched the filing hole through the model letters.) Hardly large enough to fit in a 35mm cassette, with a lens that folded into the body when not in use, these had a 35mm f2.8 lens that was every bit as good as the best SLR lenses. Or at least could be, as the first one I bought I had to fight with Leitz, the importers, to get changed as it was decidedly unsharp – at first I got back a rather sniffy letter from them pointing out that there were no performance standards for Minox products, but after I insisted they did replace it. It was a tough plastic clamshell design, but did break when it went flying out of my pocket as I ran down the street one day – and my insurance company perhaps surprisingly paid for the replacement. When that eventually broke down, Leitz apologised that they could no longer repair that model and offered me the latest version at around half price. So altogether I owned at least four of them over the years. As well as being compact, it was also virtually silent, and great for photographing inconspicuously, although its automatic exposure was not always too reliable, and as with other very small cameras it was easy to get your fingers in front of the sensor – or the camera lens – when cradling the camera in you hand. The manual film wind also sometimes took rather a hefty effort with my thumb, which occasionally became rather painful. Small cameras then didn’t necessarily mean worse results – those with good lenses could do just as well as larger beasts that took the same 35mm film and made images the same size – unlike with small sensor digital compacts. 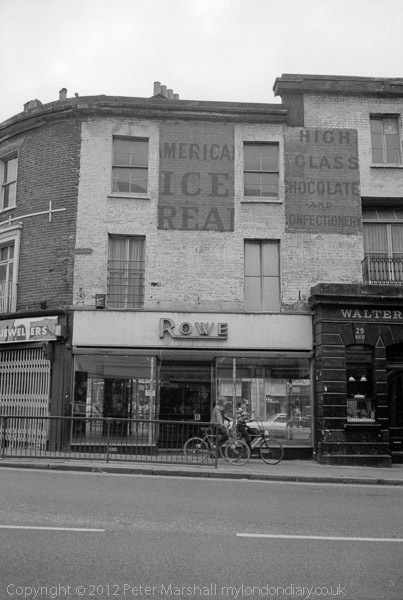 I tried a few searches on Google using the shop names I could read on this and the other thumbnails I was looking at with some likely places and drew a blank, but once I looked at the scan at more or less full size I found the picture had a vital clue. Under the large 29 above one window the tiny bit of text I had thought to be decoration was actually the rest of its very short address, Hill St. Googling that suggested Mayfair, which it clearly wasn’t, but a quick search on my on-line A-Z found just two more Hill Streets in the Greater London area, in Richmond or St Albans. I’d not visited St Albans in 1979 when the picture was taken, so it had to be Richmond, and it was good to be able to confirm this at the web site of the LB of Richmond and Twickenham, which has online a detailed walk down Hill St, and I was soon looking at a picture of 29 Hill St taken in 1900, then the premises of Mr J.H. Jarvis, but clearly the same place at that on the right of my image. Around the corner are some much more recognisable properties next to the bridge which I’ve photographed on several occasions, and facing the river were the backs of some properties including a couple of listed buildings. I used to visit the area quite often at night some years earlier than my photograph, nursing a pint of bitter for an evening in my student years as I listened to the likes of Bobby Wellins playing in the old Palm Court Hotel. 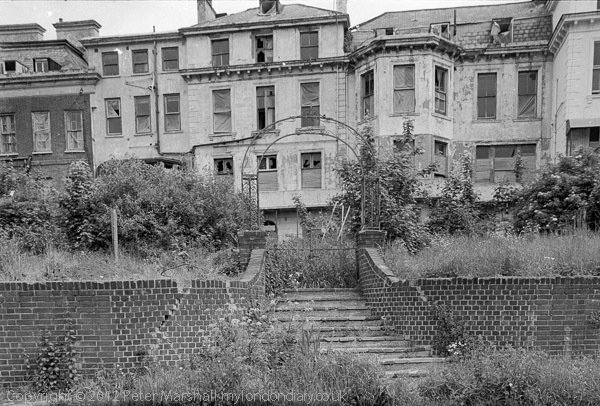 I wasn’t taking pictures then – I couldn’t afford to, as photography then was an expensive business – but later I took a few pictures of the exterior before the controversial redevelopment by Quinlan Terry in 1984 which rebuilt the Grade II listed façade but lost the atmosphere. The vertical image was taken in autumn 1979, probably with a Leica and the horizontal in May 1981, on an Olympus OM1. Little had changed though perhaps the weeds had grown a little. This entry was posted on Thursday, January 24th, 2013 at 02:34 pm and is filed under My Own Work. You can follow any responses to this entry through the RSS 2.0 feed. You can leave a response, or trackback from your own site.